Aside from financial insecurity, long-term unemployment can have devastating effects on individuals and their families. Some employers are reluctant to hire the long-term unemployed; and for older applicants, securing a job can be doubly difficult. Re-entry to the workforce after a long absence can be a daunting prospect, without help. 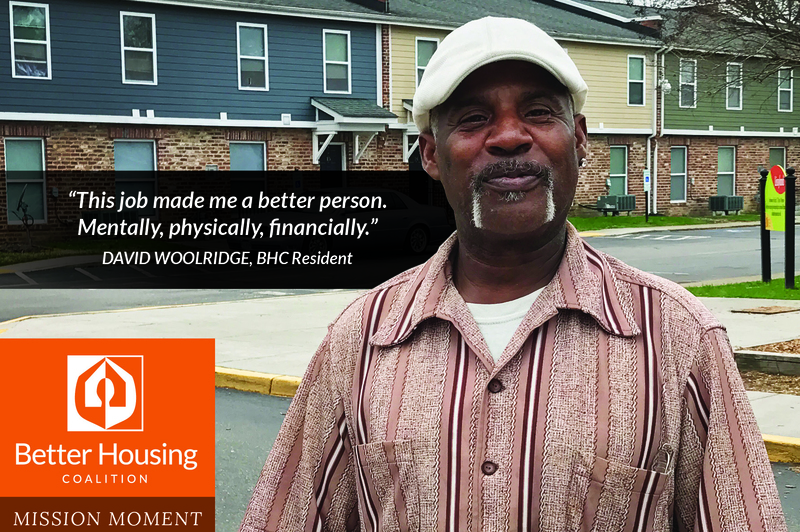 David Woolridge had been unemployed for two years when he moved into a BHC community. The 59-year-old had been taking on side jobs for family members, but they did not provide financial security for his family of five. With encouragement from BHC’s Career Navigator, Mr. Woolridge enrolled in BHC’s JOBS program at Lincoln Mews and developed an action plan for employment. Overcoming his initial insecurity with technology, he began to apply regularly for jobs, and was soon contacted to interview for a part-time janitorial position. During the interview, the hiring manager noticed Mr. Woolridge’s experience in housekeeping and management and, instead of offering him the part-time job he applied for, hired Mr. Woolridge for a full-time supervisor position on the spot. Mr. Woolridge was ecstatic. Taking the first steps by enrolling in BHC’s JOBS program gave Mr. Woolridge the confidence he needed to get back into the workforce. Beyond housing, the Better Housing Coalition empowers its residents with programs to help them reach their fullest potential, at all stages of life. BHC’s resident services programs are 100% funded by donations from our supporters, and all gifts are tax-deductible. If you believe as we do that everyone deserves better choices in where they live, work and play, consider making a gift so that more of your neighbors can thrive.